Planning your meals ahead of time is the best way to take the stress out of busy days and make sure your family eats healthy food. 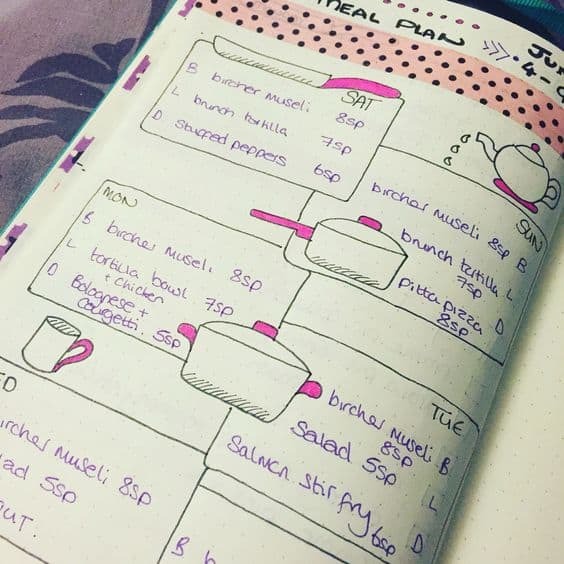 Quite often the hardest thing about meal planning is having a system and making it a habit which is why today we’re exploring clever Bullet Journal meal plan ideas to help you get into the swing of things! If you think about it, meal planning consists of a list full of lists: a list of meals to prepare for this week, recipes for those meals that are composed of a list of ingredients and a list of steps, a separate list of the ingredients you need as opposed to those you already have, and a list of where to get certain ingredients that you can’t find in your usual supermarket, and, finally, a list of how much it all costs. Wow! 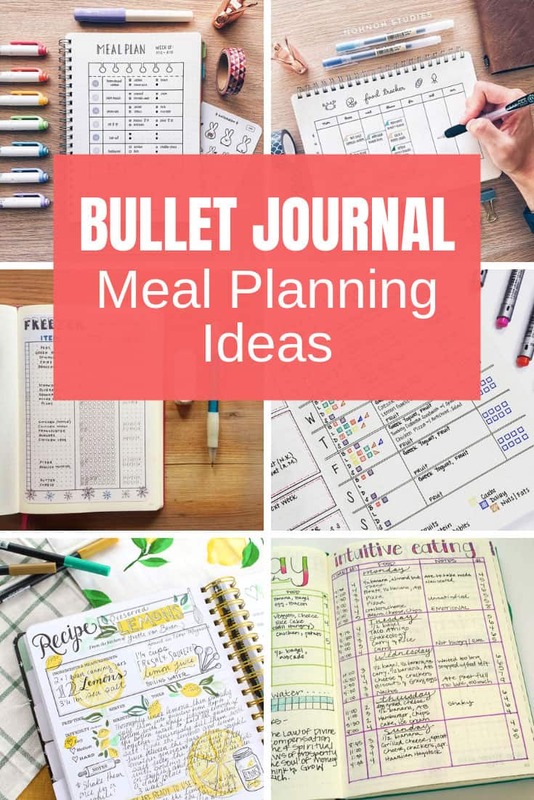 With all these lists it makes total sense to use your Bullet Journal for meal planning right?? 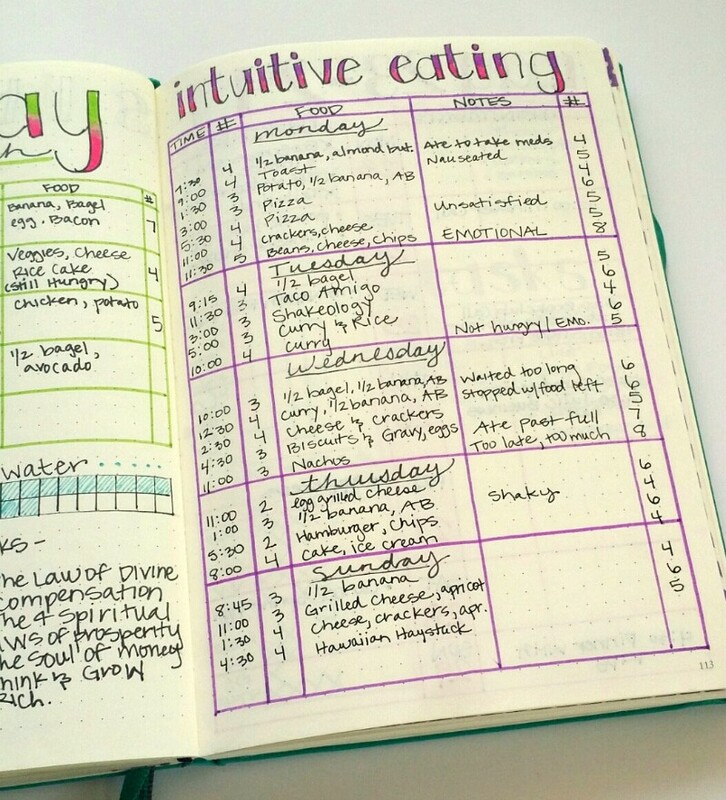 Let’s take a look at a quick and easy way to plan a week’s meals for your family using a blank page in your journal. Think of a typical week’s worth of meals you would like to make. Choose meals you have been craving, meals you already have a bunch of ingredients for, or whatever else works for you. Start with your first meal and list all the ingredients. Use a distinct bullet symbol (like a *) for those you need to purchase more of. Repeat for all other meals, but only use the distinct “buy more” bullet point once per ingredient. 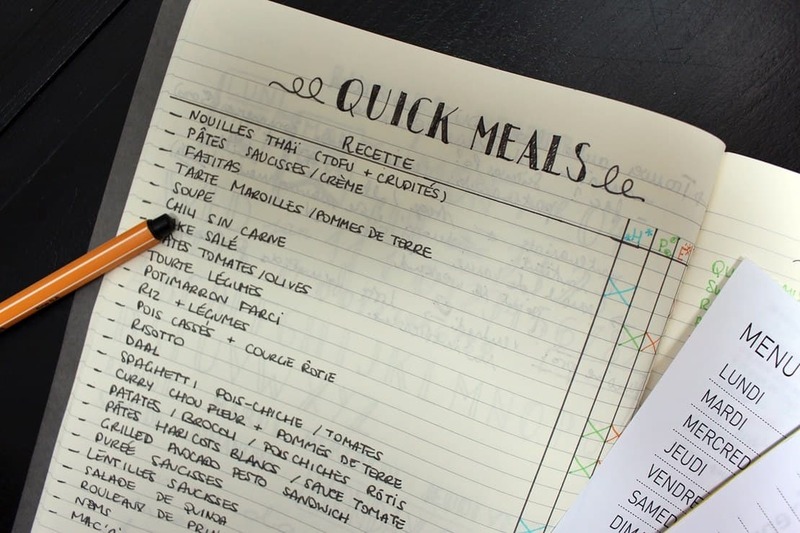 When all your meals and corresponding ingredients have been listed, make a note of quantity needed for each ingredient you need to buy next to the distinctly bullet pointed items. That way, you can quickly see which items, and how much of them, you need to purchase. 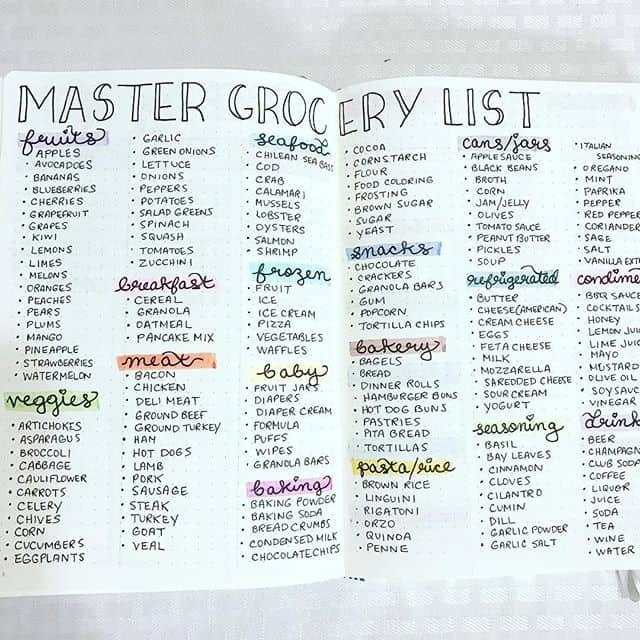 When you’re at the grocery store, or ordering your food online you can see exactly what you need to buy right there in your Bullet Journal! 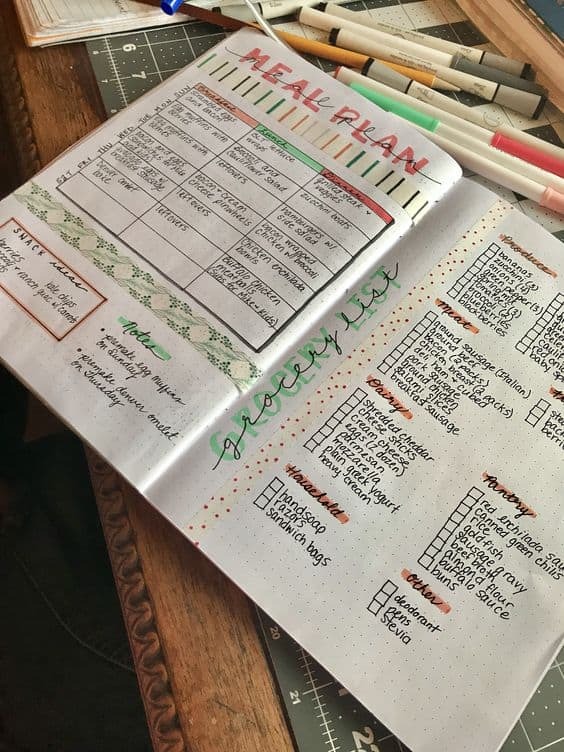 If you spend the weekend cutting coupons but forget to bring them to the store it’s time to put your BUJO to work! As you cut your coupons go back through your list and note down which ingredients you have coupons for. Then store them inside your journal. Now when you’re at the store and you open up your shopping list your coupons are right there where you need them! You might also want to start a tracker spread of the brands you prefer, the stores where you can actually find the ingredients you need and also the price of the items you buy most often so you can stock up when they’re on offer. 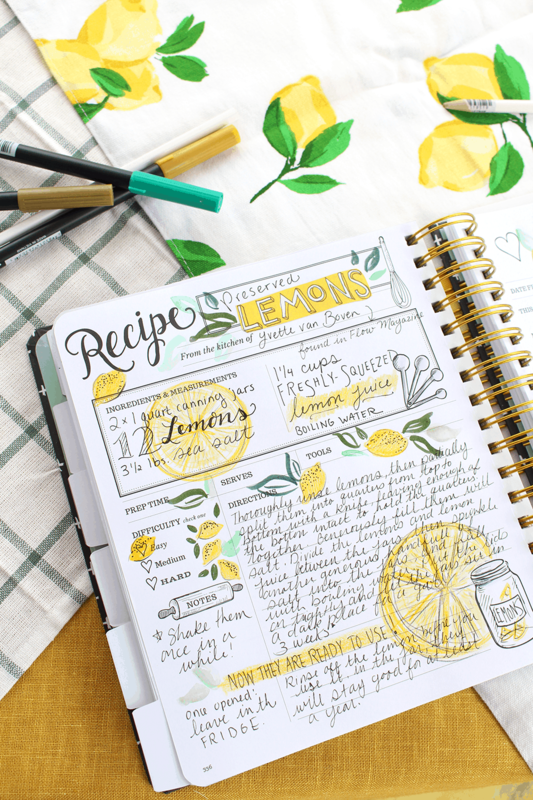 You probably have a bunch of go-to recipes that you use regularly and it’s worth taking the time to write these out in your Bullet Journal. You can detail the substitutions that you’ve made due to allergies or intolerances, as well as the temperature and length of time things actually take to cook in your own oven! 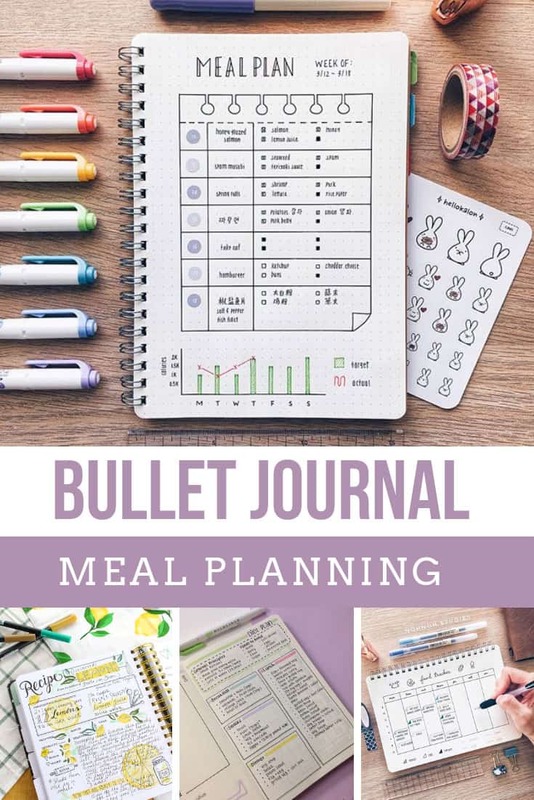 The major advantage of using your Bullet Journey for meal planning is that you get to tailor it to your own organizational style, and you have everything you need in one place. It puts an end to wondering what you did last time to make the sauce thicker or standing in the middle of the supermarket, searching through multiple recipes on your phone to figure out how much butter to get! Trust me. 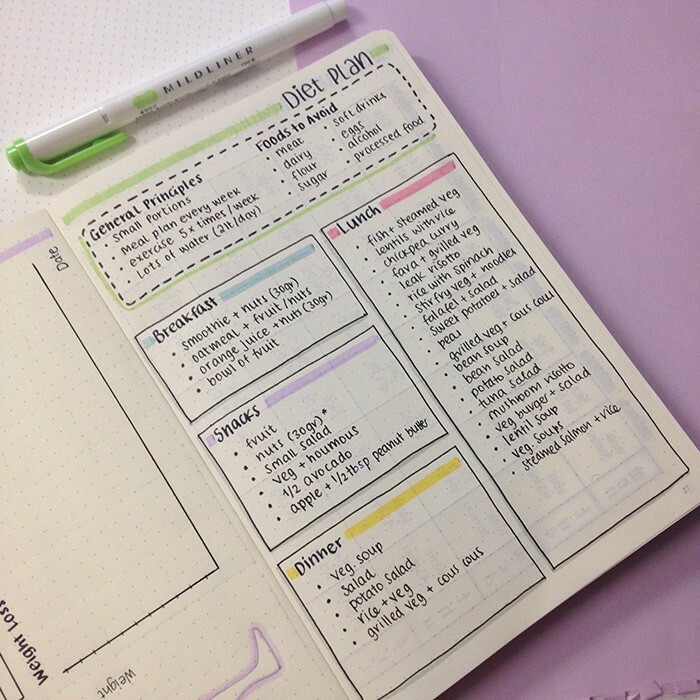 The more you use this system the more ways you will find to use your journal! 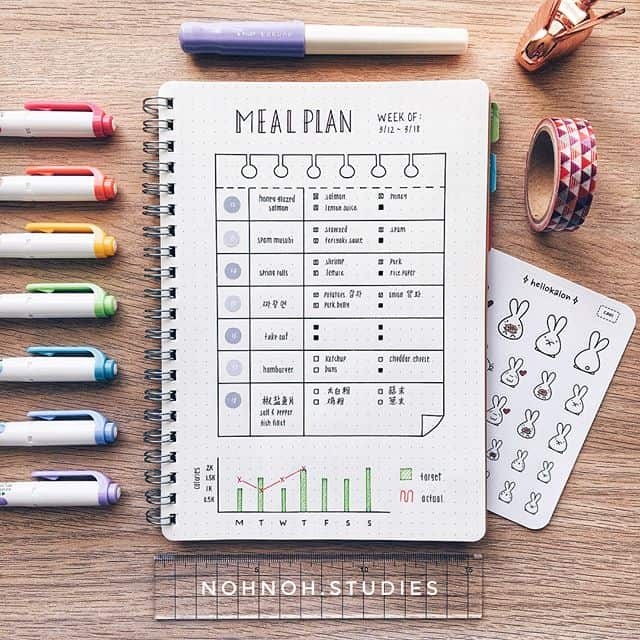 Ok so you’ve got the theory, but if you’re like me you need to SEE some examples of spreads and layouts before you can formulate your own meal plan trackers right? Well don’t worry because I’ve been pulling together all kinds of creative spreads to help you. 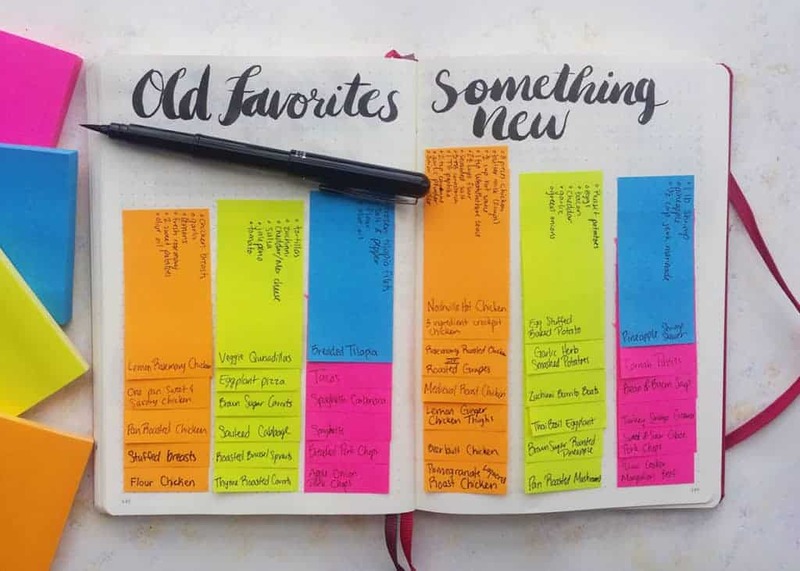 From keeping a master shopping list to journaling favorite recipes and then of course planning out your meals week by week, there are so many ideas here to help you pull together a Bullet Journal tracker that will help you plan your meals like a pro! 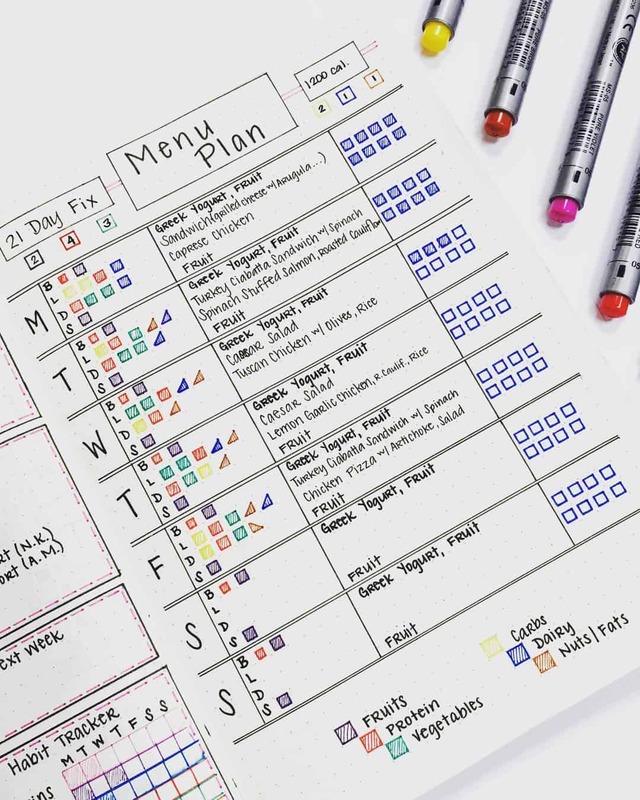 I like how this menu plan spread is laid out, it’s perfect for planning out your 21 day fix meals but you could use it for regular meal prep too. 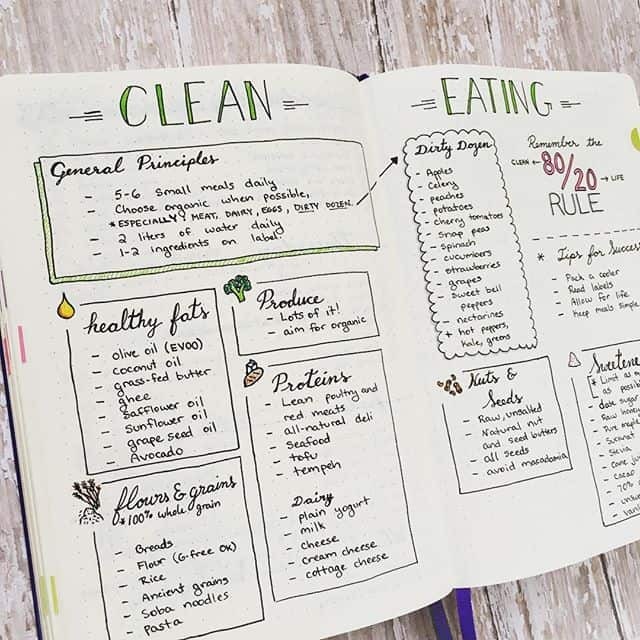 Here’s a good idea for keeping track of which foods you’re allowed to eat if you’re trying the Clean Eating lifestyle. 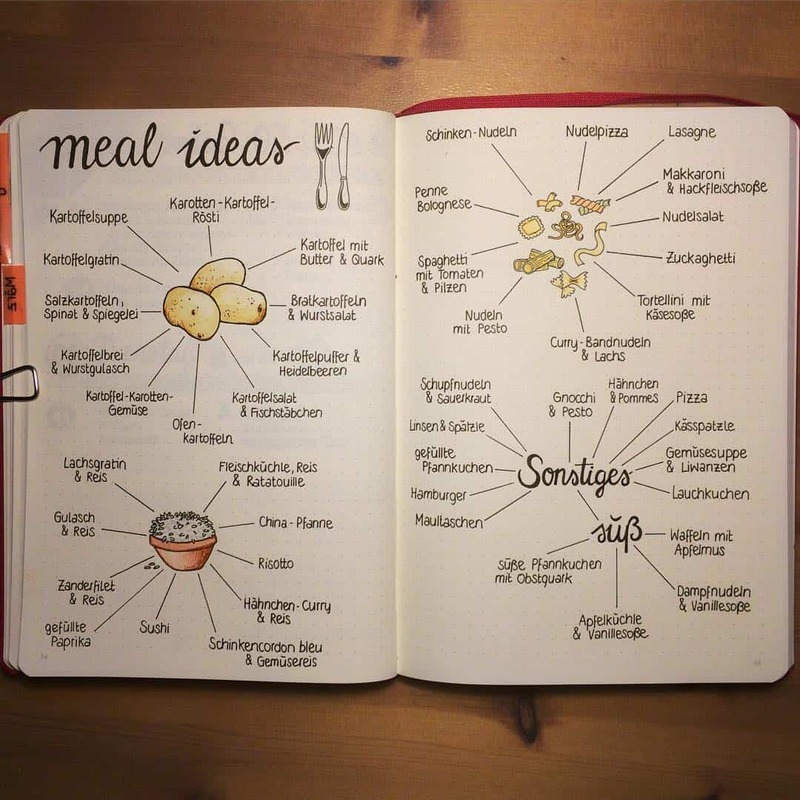 You don’t have to be on a diet to use a spread like this in your Bullet Journal, I really like the idea of a goto list of ideas for the different meals during the day. 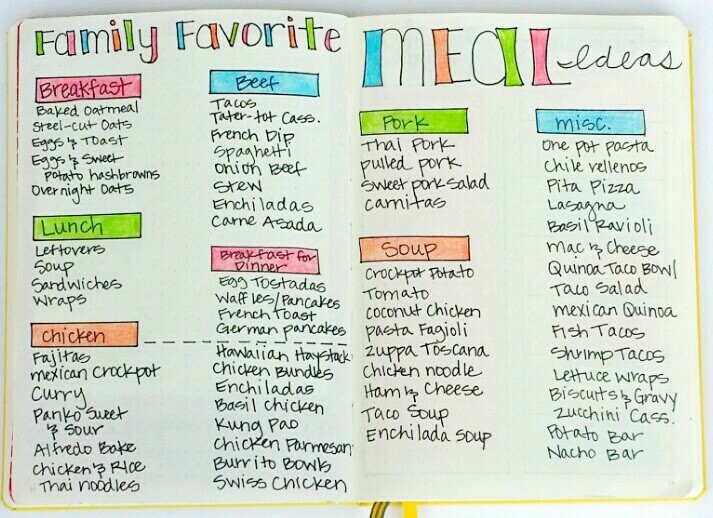 Or try this spread to capture your family’s favorite meals to refer to when you’re planning your week ahead. And why not go one step further and journal those recipes so they’re always at hand when you need them! If you’re not sure how many times a week you actually eat takeout try this food tracker spread for a week to see! 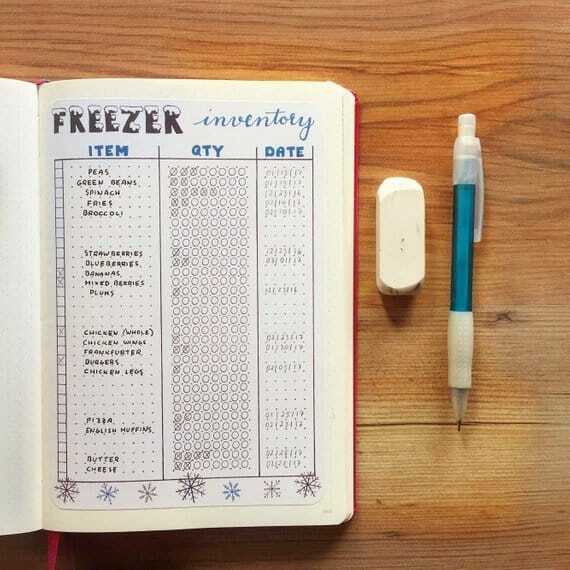 If your meal planning includes batch cooking and filling your freezer then you’ll definitely need a freezer inventory spread like this one in your Bullet Journal! Recording your master shopping list split out by aisle makes going to the store a lot less stressful! 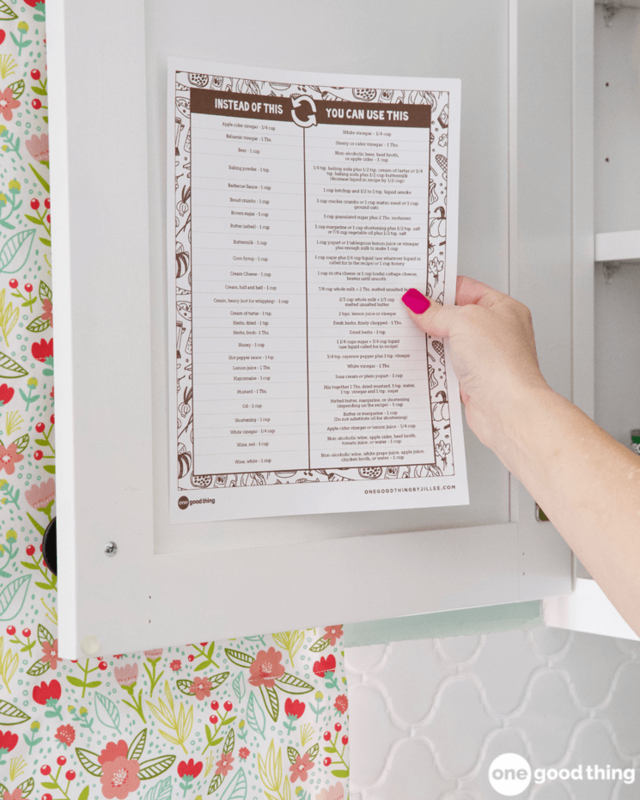 This printable is designed to be stuck inside your pantry but I think keeping a copy of this food substitutions list in your Bullet Journal is a genius idea! If you want to keep track of how the food you eat affects your body and your emotions try an intuitive eating spread like this one. 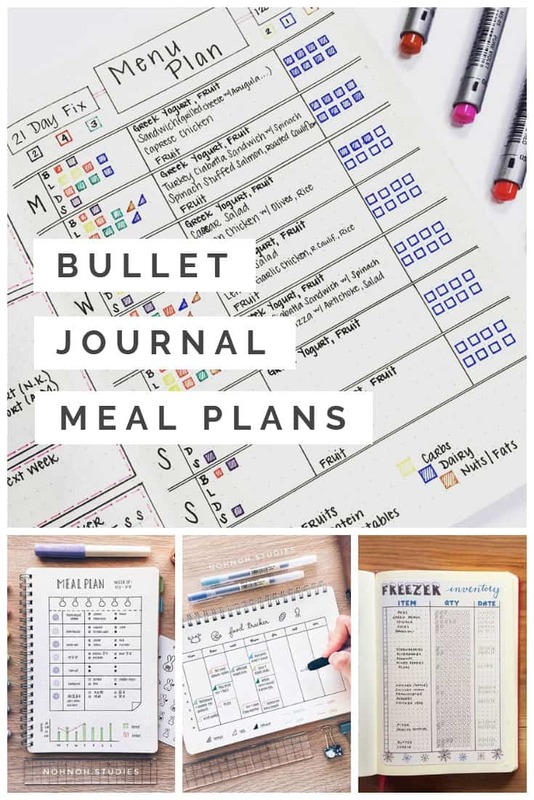 You can meal plan for your keto diet in your Bullet Journal too. 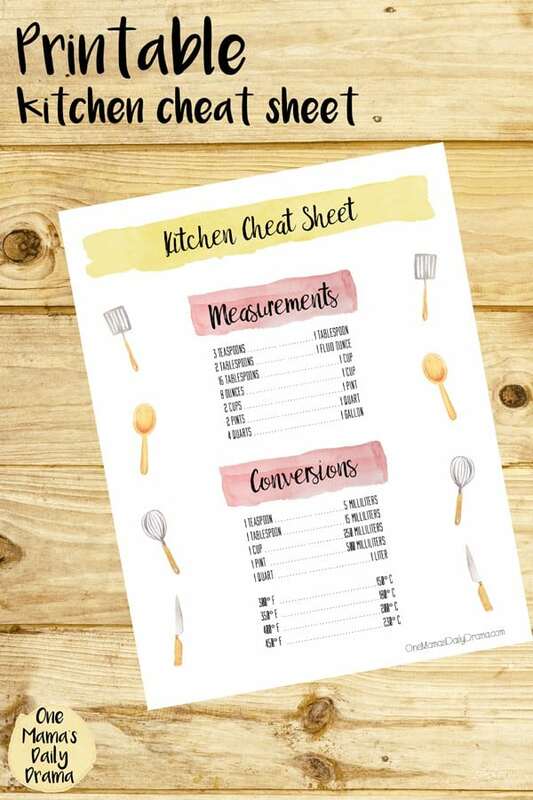 If you’re like me and you never seem to have the right sized cup or spoon when cooking or baking stick a copy of this printable in your journal to help you! 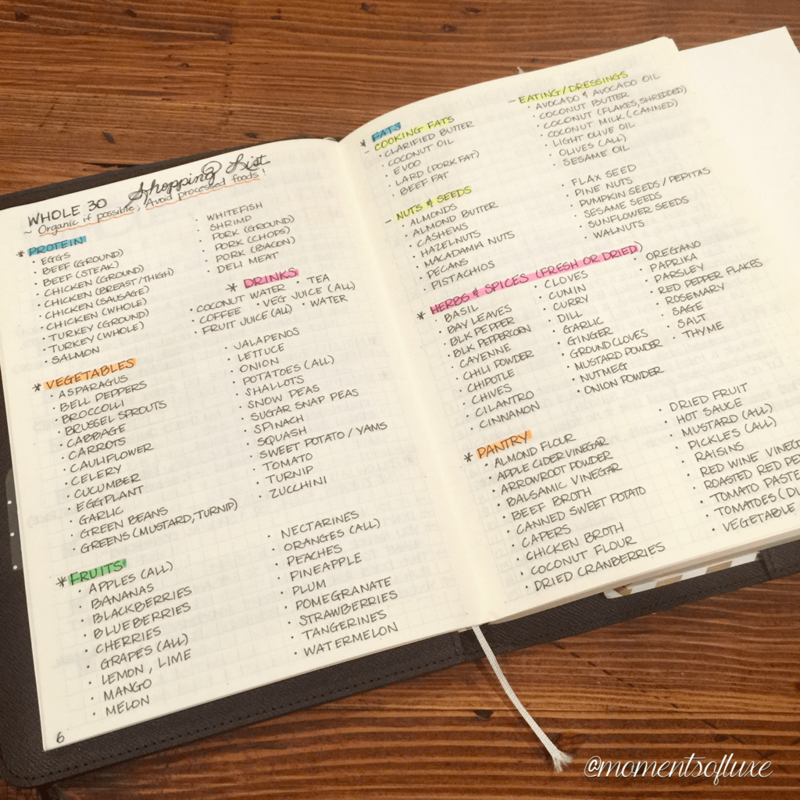 I love this layout to help you choose recipes based on the staples you have in your pantry. 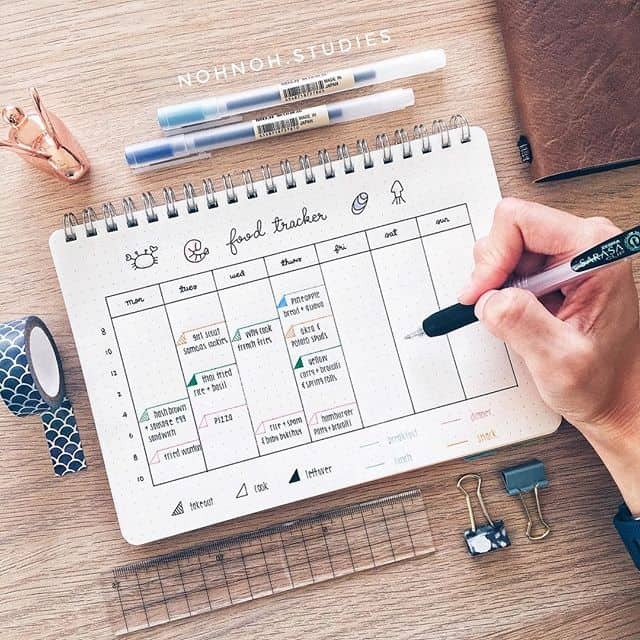 Here’s a clever way of combining your meal plan with a calorie tracker. If you don’t want to plan your meals for every day of the week why not designate one day as Quick Meal day. You can choose what you really feel like eating from the list knowing it won’t take long to actually pull together. Ooh love this idea of using post it notes so you don’t have to keep writing everything out over and over! Just because you meal plan doesn’t mean you can’t eat out ever again. 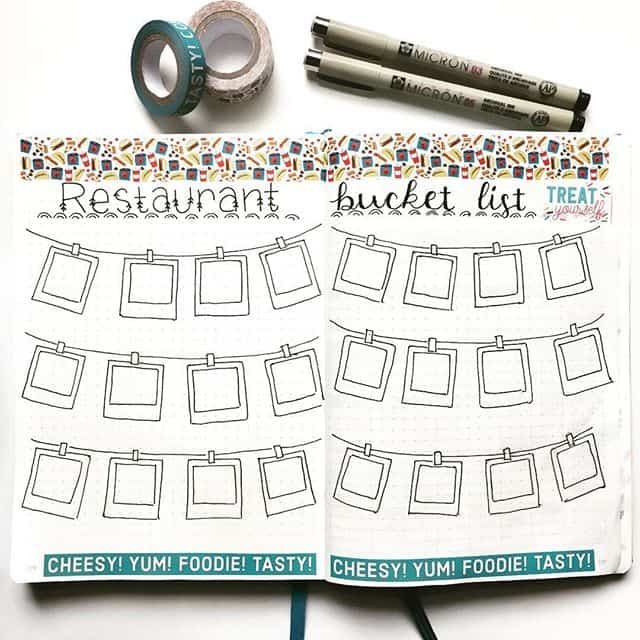 Use a bucket list tracker like this one to decide where you what to go when it’s time to treat yourself! If you’re doing Slimming World or anything else that requires tracking points for each meal you can do it as easily as this. 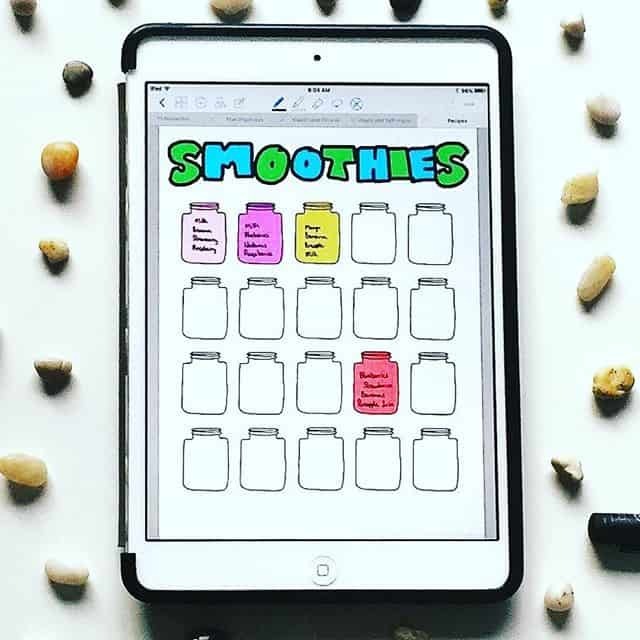 Here’s a great idea for tracking all the new smoothie recipes you want to try! 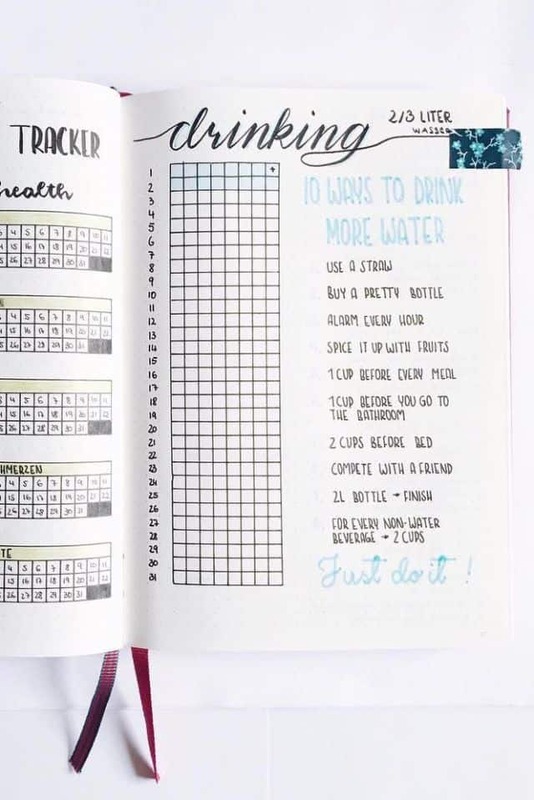 Ok so it’s not specifically meal planning but while we’re talking about tracking all things food we need to remember to drink our water too! If you’re embarking on the Whole 30 you will not want to miss this shopping list spread!